Moray’s newly elected MP believes complacency at the polls has come back to haunt the SNP. 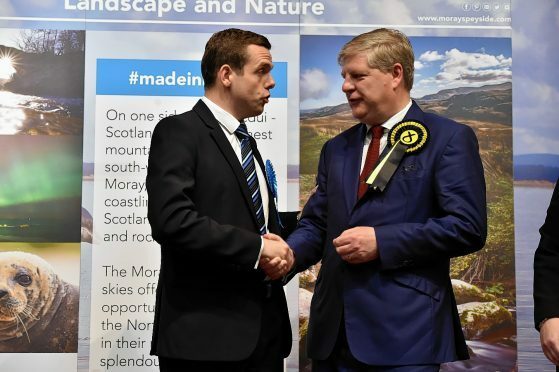 During the campaign Douglas Ross was accused of “overblown arrogance” and “taking votes for granted” by Angus Robertson for targeting the seat, which has been an SNP stronghold since 1987. However, the Tory stunned the pundits by overtaking the SNP deputy leader with a swing of 13,000 votes – more than a quarter of Thursday’s turnout. Last night Mr Ross believed the SNP’s language had been “ill-advised” during a “heated” and “aggressive” campaign against him. And the Conservative believed high-profile victims Mr Robertson and Alex Salmond had been punished for focusing on Westminster grandstanding instead of local concerns. He said: “During the campaign people would always tell me that an MP’s first duty was to the local communities they serve. If you don’t pay attention to local issues then the people can quickly vote you out. Mr Ross added: “The SNP just assumed that people would vote for them regardless, in what used to be their heartlands. Mr Ross, who will resign his seat as a Highlands and Islands MSP next week, has also vowed to continue as a football referee when it does not interfere with his parliamentary duties, explaining “everyone deserves a hobby”. The MP’s winning margin of more than 4,000 came despite his name not appearing on some ballot papers in Forres. Conservative officials explained a “printing error” had resulted in Mr Ross being missed off some sheets. It is understood only four votes were affected. Before making a swift exit from the Elgin Town Hall count Mr Robertson explained it had been an honour to represent “the finest part of Scotland”. He said: “I have no regrets, apart from not winning this election, but that is the nature of politics.